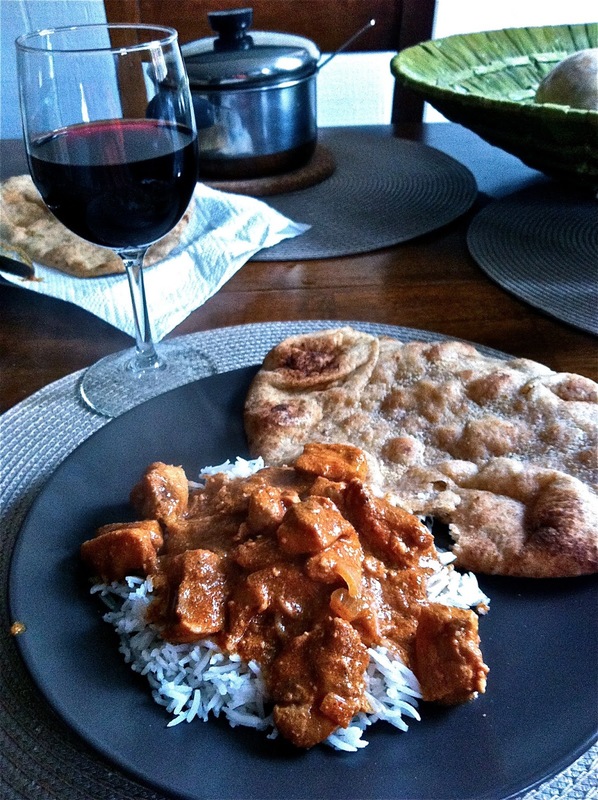 The first time I made this butter chicken, I was right out of college and just beginning my cooking adventures. Well, I still am a beginner, in the scheme of things, but I was really a beginner at that point. 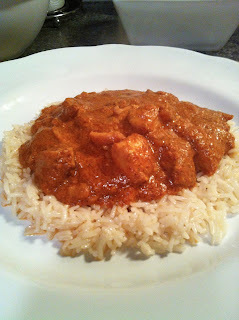 I followed the original recipe pretty closely that first time, still unsure of how to experiment with different flavors and substitutions (especially with Indian food). It was amazing. When I tasted it for the first time, I actually couldn't believe that I had made something so delicious. Since then, I've done a little tweaking to the recipe to fit my tastes and preferences, and it is still one of my very favorite meals to make. The way it smells when it's cooking... the complex Indian flavors... the fact that the crockpot does a lot of the work... so much to love! It's a recipe that makes you want to share it with others and make it for guests. 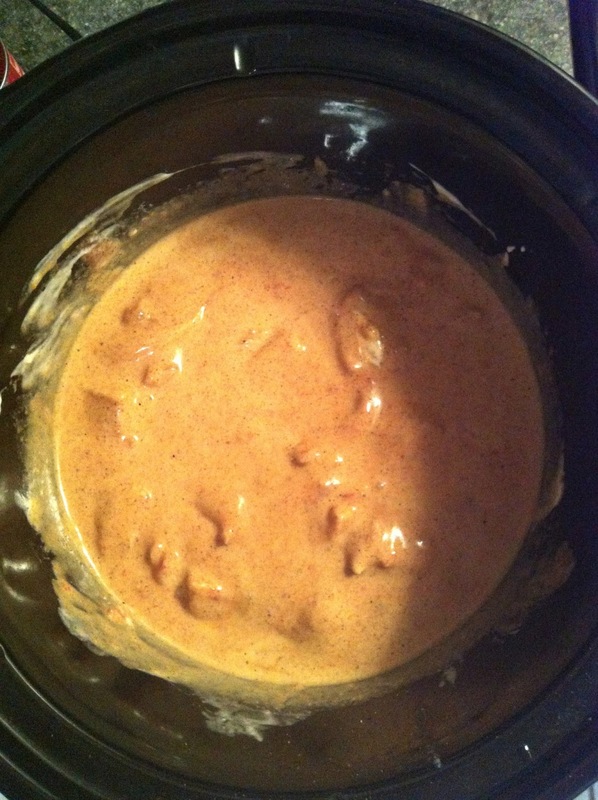 While it's really quite easy to make, it tastes like you must have slaved in the kitchen. I have to admit, this is not the type of crockpot recipe I typically go for. It requires a good amount of work before you actually get it in the crockpot, which I'm not usually a fan of. I prefer the "throw it all in and go" method, especially on busy days. This is more of a weekend crockpot meal, for when you have time to do a little prep in the morning. But trust me... it's worth it. 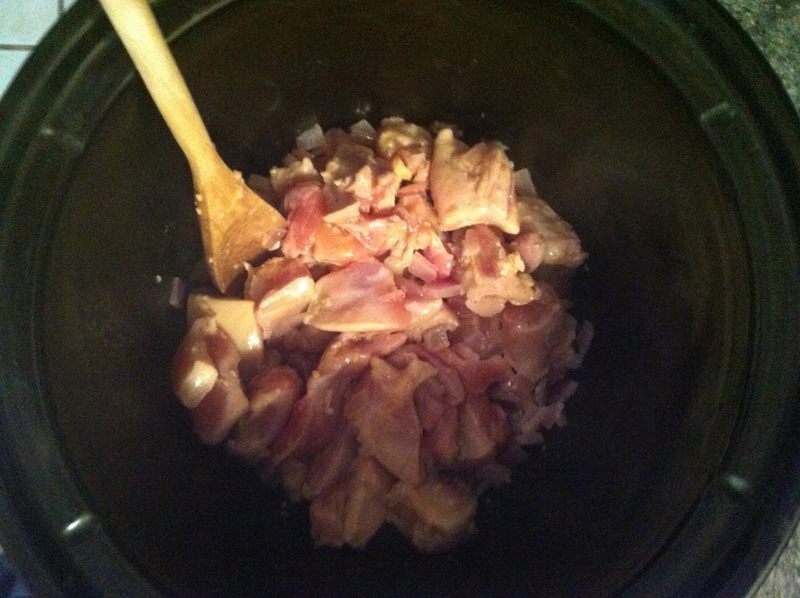 First, chop 4-6 chicken thighs (about a pound and a half) into large-ish bite-sized pieces. 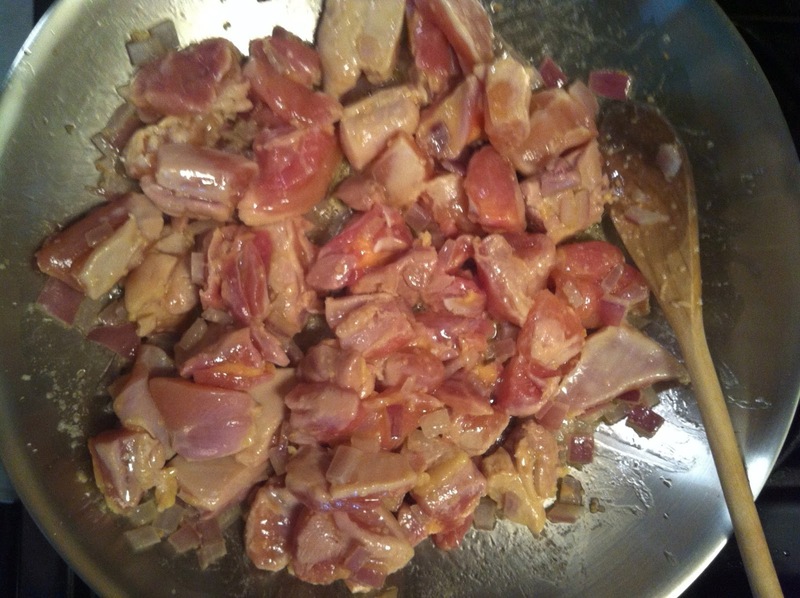 Then, chop half of a white or red onion, and mince 4-5 cloves of garlic. Heat 2 tablespoons of butter and 2 tablespoons of olive oil over medium heat. Add in the onion and cook for 3-4 minutes. Then, add in the garlic and saute for about 30 seconds. Next, add in the chicken. Cook until the onion is translucent and the chicken has some color to it, about 3-4 more minutes. 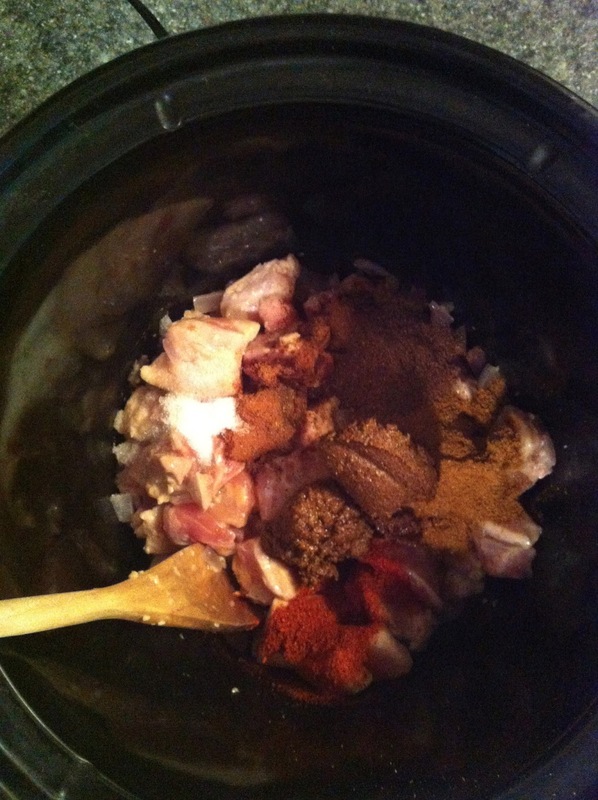 Pour the whole mixture into the crockpot. Gather the rest of your ingredients. 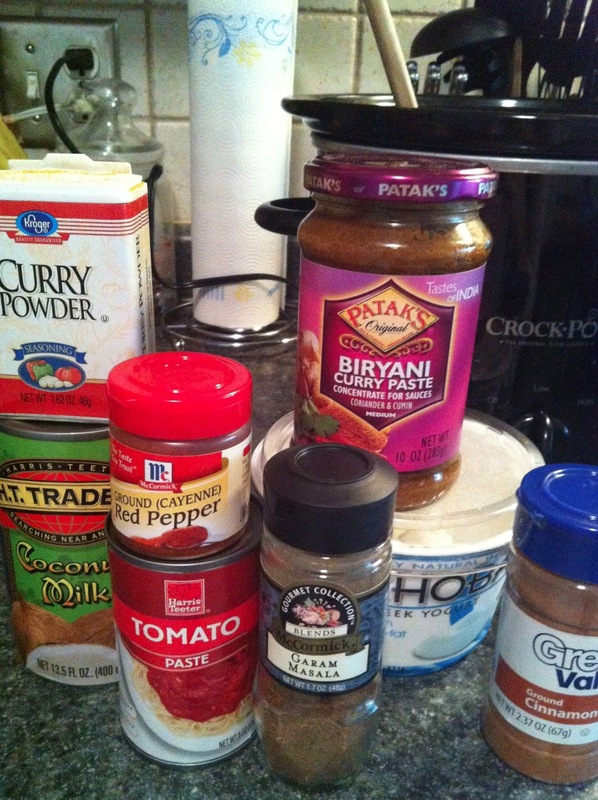 You'll need several spices: curry powder, cayenne, cinnamon, salt, and garam masala (you should be able to find this in the spice section, or in the international aisle). One can of coconut milk. One cup of plain yogurt -- I've recently started using Greek yogurt in this recipe, as opposed to regular, to add in a bit more protein; I do think it makes the sauce slightly less smooth/creamy than with regular plain yogurt, but it doesn't bother me personally... take your pick! You'll also need a 6 oz. can of tomato paste and some curry paste. I used Patak's Biryani version because it's what I had in my fridge (and these jars aren't cheap), but I actually prefer Patak's Hot Curry Paste. You can also find curry paste in the international aisle of the grocery store. As well as the wet ingredients. Now just set the heat to low, and cook for about 7-8 hours. Just wait till the delicious Indian scents start to fill your house... mmmm! When you're ready to eat, serve by itself for a delicious, low-carb meal (that's how I have it for leftover lunches), or (for best results...) serve over basmati rice with a side of whole wheat garlic naan. -Heat the butter and olive oil in a pan over medium heat. 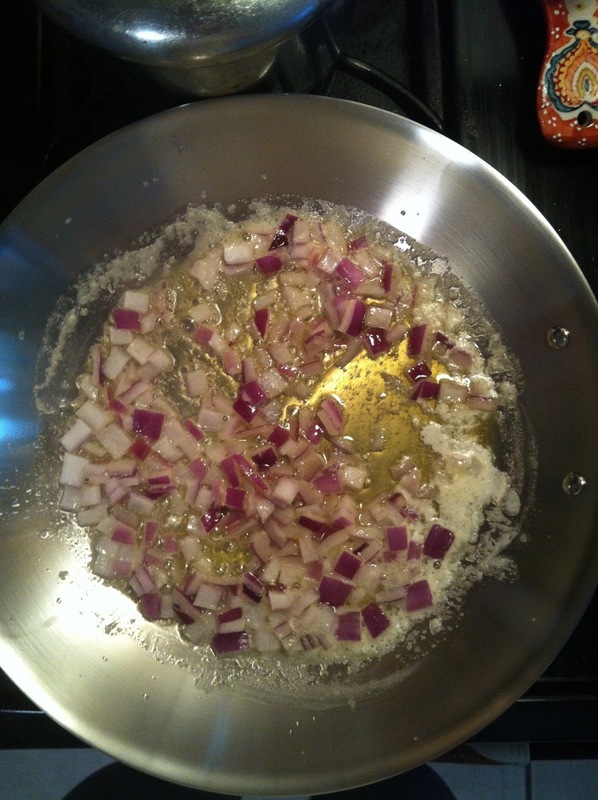 Add onion, cook for 3-4 minutes. Add garlic, cook for 30 seconds. 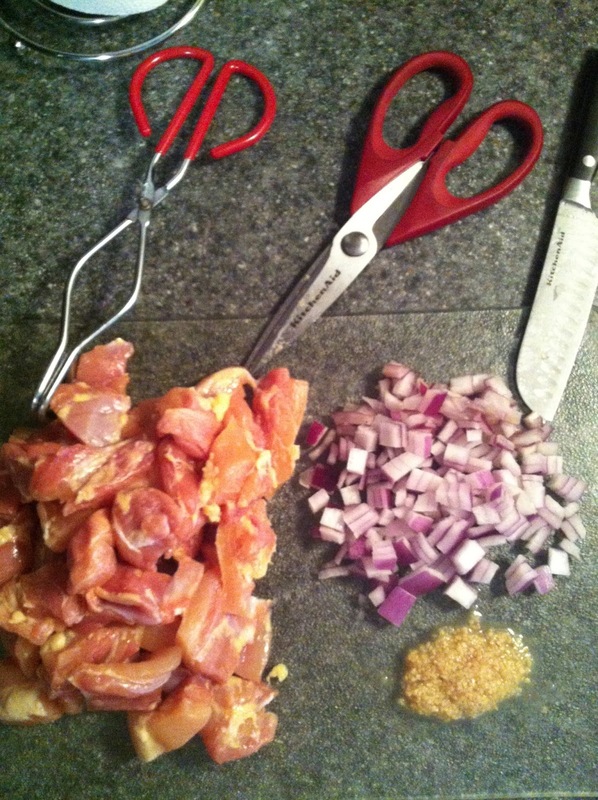 Add chicken, cook until it starts to get some color and the onion is translucent, about 3-4 more minutes. 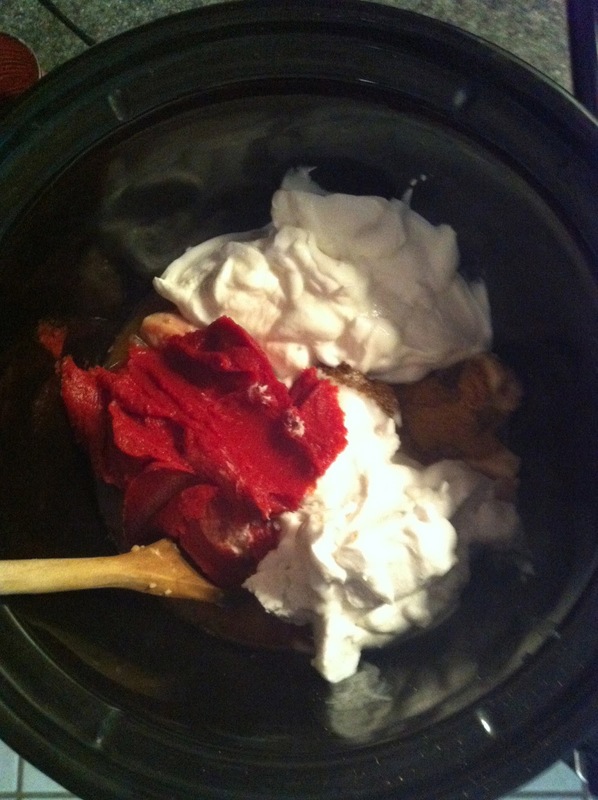 -Pour into crockpot. Add remainder of ingredients. Stir gently. Cook for 7-8 hours on low. 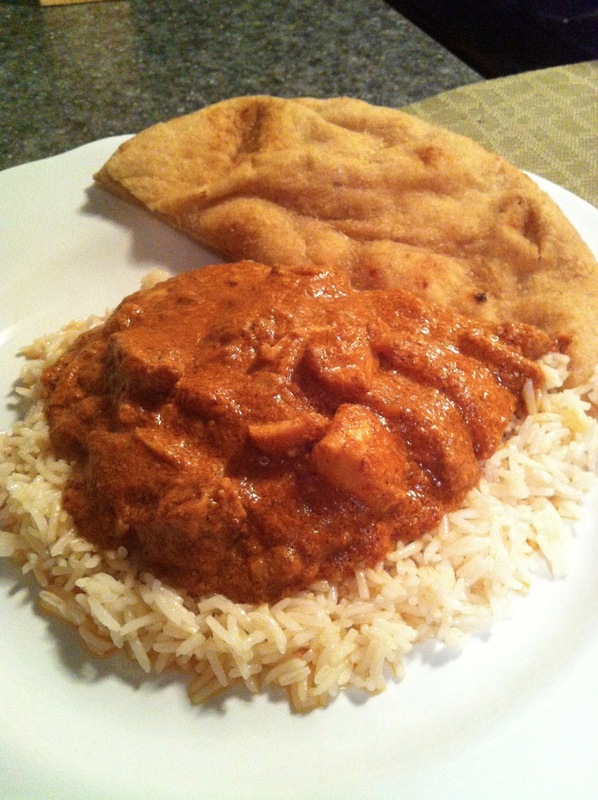 Serve by itself, or over basmati rice with a side of whole what naan. This is one of the first recipes you ever shared with me and it continues to be a favorite. SO AMAZING. 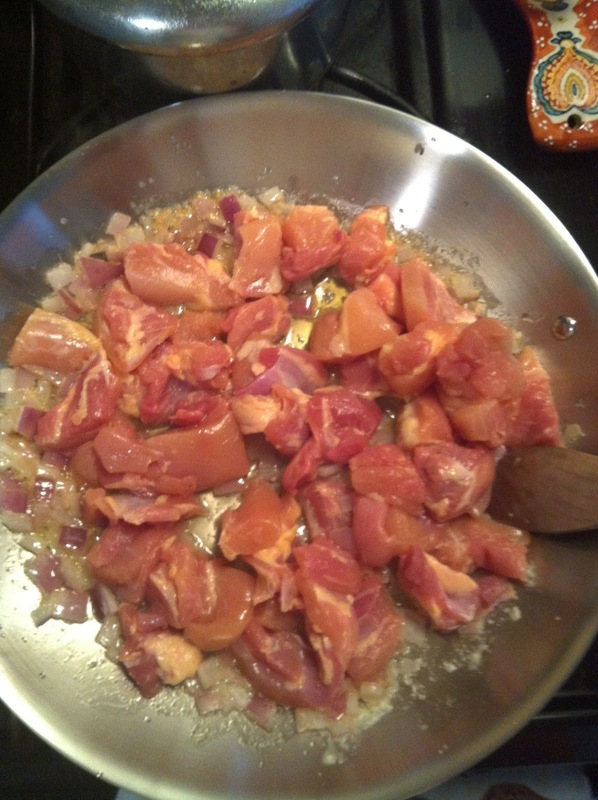 I know you swear by chicken thighs, but I do like it with breasts, too!!! I just made this and it was AMAZING. Been wanting to try something like this and it was easy and delicious. 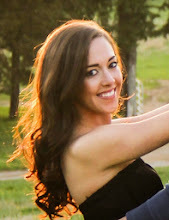 Your blog is so cute I can't wait to try other recipes!